In poker, the term backdoor refers to making a hand with cards on both the turn and the river. In Texas Hold'em, if a player has three cards to a flush or straight and gets the cards needed on the turn and river, that hand is a backdoor flush or a backdoor straight, and the player won the hand by way of the backdoor. In common language, a backdoor often refers to an unknown or unobvious access point, such as in a computer program. The implication of the term in poker usage is that the player achieved the hand through unlikely means. The poker term runner-runner, or runner runner, is often synonymous with backdoor or back door. A minor distinction in usage is that backdoor refers to both the draw and the resulting hand, but runner-runner typically only refers to the draw. For example, a player hit a backdoor flush draw or hit runner-runner hearts. More often than not, a backdoor flush or straight is an unintentional hand. Usually, a player is trying for a more likely hand and gets lucky. Other times, a player bluffs and the opponent calls it, which forces the bluffer into a longshot. 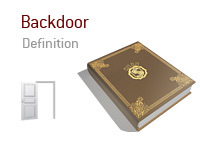 Because of this, poker players also use the term backdoor to refer to any unintentional hand. Typically, however, players reserve the term for the unlikeliest hands. The probability of a backdoor flush is less than five percent.